This is the crazy season of bourbon. Super-hard-to-find, rare, limited editions are being released in very small quantities, and buyers are going to ridiculous lengths to get them. Some want to drink them, others are looking to profit off a secondary market where a rare bottle purchased one day can sell for many times the retail price a few days later. Here’s an example: Two days ago a bottle of Old Forester Birthday Bourbon I had ordered arrived at my local liquor store. But because it was listed in their online inventory, by the time I had picked it up the store manager said he had received dozens of calls for the bottle. Just two years ago I bought three bottles for the same price with no fuss at all and I could have (and probably should have) bought many more. Wild Turkey Master’s Keep bourbon is certainly a product of that craziness. 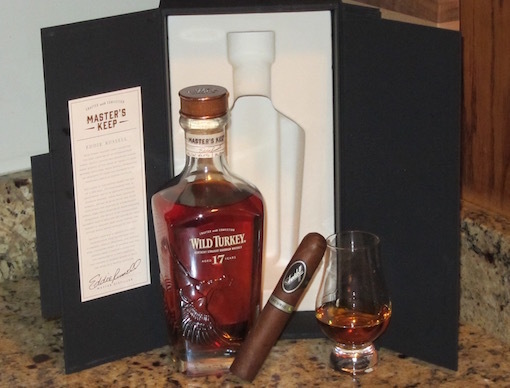 The 17 year Wild Turkey is the oldest ever released by Wild Turkey, and Wild Turkey knows that such a rare bourbon can command a price; in this case, $150 for a 750 ml. bottle. Albeit rare, that high price (even in this overheated bourbon market) has meant that a month after the release you can still find Master’s Keep on some shelves if you want one. The story of how this bourbon came to be is a complicated one. Long story short, after being distilled in 1996, the barrels spent only a short period of time in Wild Turkey’s warehouses before they were moved to brick warehouses nearby. In 2003, they were moved again to different brick warehouse before finally being moved back into traditional wood and metal Wild Turkey rickhouses in 2010. The time in brick warehouses, where bourbon tends to age more slowly, has had a considerable impact on the bourbon. For one thing, rather that increasing in proof over time, Master’s Keep decreased in proof over time, to 43.4% ABV (86.8-proof). The result is a bourbon with a truly fantastic nose. It’s a rich combination of mulling spices, apple, pear, tree sap, and pie crust. On the plate there is caramel, clove spice, burnt sugar, and oak. The finish features lots of dry oak. It’s a unique and delicate bourbon that deserves an equally subtle cigar. A few recommendations: Illusione Singulare LE 2014 Anunnaki, Paul Garmirian Gourmet, and the Tatuaje Black Corona Gorda. Ultimately, however, when it comes to price I have trouble spending $150 on Master’s Keep. It’s not that it isn’t good. It is. And it’s surely unique and tasty. But anticlimactically, the nose is the aspect of the bourbon that stands out the most. I would highly recommend trying to find some in a bar before shelling out for a full bottle.